GstarCAD launched a upgrading program as a part of its 20th anniversary celebration and got good response from clients and prospects. GstarCAD 2012 unveils its unique functions including Boolean operations on polylines, exporting tables to Excel spreadsheets, and incrementing copied text etc. to minimize repetitive tasks, and greatly improve the efficiency of GstarCAD 2012 customers. FIPA introduces lightweight suction fingers and angle arms. Structurally optimized light-weight, modular, adjustable suction fingers weigh up to 50% less than their predecessors. Fisnar Introduces the UNITOP F5200N, a versatile new dispensing robot that can be used as a desktop or gantry system and allows users to create their own working space. New orders for motion control products are up 19% through the third quarter of 2011, according to new statistics released by the Motion Control Association (MCA). Point Grey, a world leader in advanced digital imaging products, today announced the addition of new VGA and XGA models to its Flea3 GigE Vision digital cameras series. Intellibot Robotics Moves Headquarters to Portland, Ore.
Intellibot Robotics LLC ("Intellibot"), an award-winning manufacturer of robotic commercial floor cleaners, has moved its headquarters to Portland, Ore. Previously based in Richmond, Va., Intellibot will maintain its manufacturing and engineering operations in Virginia. The company's new Portland office, at 5410 SW Macadam Ave., Suite 100, houses administration, sales, finance, and marketing functions. Northrop Grumman Corporation and the U.S. Navy will be able to increase the pace and productivity of the X-47B flight test program following the successful first flight Nov. 22 of the second air vehicle developed for the Navy's Unmanned Combat Air System Carrier Demonstration (UCAS-D) program. Wind River, a world leader in embedded and mobile software, today announced that Comau Robotics, one of the worldwide leading manufacturers of high quality industrial robots, is running Wind River's VxWorks real-time operating system (RTOS) for its C5G system, the latest generation of its Robot Control Unit. 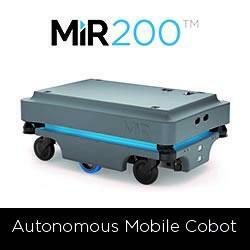 MiR200 is a safe, cost-effective mobile robot that automates your internal transportation. The robot optimizes workflows, freeing staff resources so you can increase productivity and reduce costs. MiR200 safely maneuvers around people and obstacles, through doorways and in and out of lifts. You can download CAD files of the building directly to the robot, or program it with the simple, web-based interface that requires no prior programming experience. With its fast implementation, the robots offers a fast ROI, with payback in as little as a year.